Join the discussion on our forums! Come discuss Corpse Widow over in our dedicated Corpse Widow discussion topic. Your Deathrattle cards cost (2) less. Her marriage survived death, but it decayed pretty quickly after that. They should change the text to: Your Deathrattle "Minions" cost (2) less. Because cards like Play Dead , Terrorscale Stalker and Spiritsinger Umbra are not discounted and are a Deathrattle "cards". No, those cards interact with deathrattle minions/cards, but aren't deathrattle cards themselves. As an earlier poster commented, this would work (in theory) with deathrattle weapons like Death's Bite or Powermace. Y'all are high of you think this card will save the shithole hunter is in. Great Card, 4/6 Body is a Hunters dream against Priest. 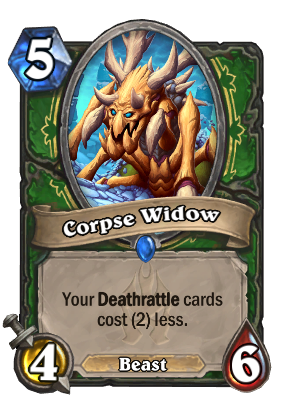 Comparing it to Nesting Roc where it depends on a Battlecry for the card to be good (4/7 Body is still nice) but with Corpse Widow, its a major threat if it can survive a turn, so it basically has Taunt and being a Beast is just a bonus. Going to have lots of fun with this card! The card's effect reads: Your Deathrattle CARDS costs (2) less. Does this mean cards like N'Zoth, the Corruptor and Feign Death also get their costs reduced? First: It's not a Battlecry but a static ability. Second: The wording seems a bit odd but i highly doubt it reduces the cost of cards other than of minions with Deathrattle. Why does it feel like Blizzard is always been trying to make Deathrattle Hunter a thing... again? The Whispers Of The Old Gods legendary is just one example. Thanks for finally bringing Hunter back to the meta :) but where is our weapon? This card is good all around for hunter. I would even stretch to say that it could be what is needed to enable Deathrattle Hunter as well with use of N'Zoth, the Corruptor and Princess Huhuran. Doubtful that the deck will do well when aggro decks tend to do better anyways though. what is this thing supposed to be? 4 mana Highmane. Yes please! Very useful for deathrattle decks and with pretty good stats, this might be a very valuable card. WOW! I love this card! Hunter is my favorite class, and seeing some dank card like this is really exciting! Sure, the 'perfect scenario' will happen where you dumb your hand onto the board, but this could actually be fine standalone in a normal midrange hunter shell. I see a very good deck revolving around this card, the meta might have to slow down a bit though. This card allows you to play cheap death rattle minions like Fiery Bat for free and get a sizable discount on larger ones like Savannah Highmane. This card is an excellent step in the right direction for Midrange Hunter and the the possibility of Control Hunter. As a believer in Control Hunter, I think this is a step in the right direction, and, as others have said, now Hunter just needs a few good spells to back up the archetype.